More than half a million Canadians are living with dementia, a number the Alzheimer Society of Canada projects will rise to nearly a million in 15 years. Dementia and other neurodegenerative diseases are difficult to diagnose, particularly in the early stages. 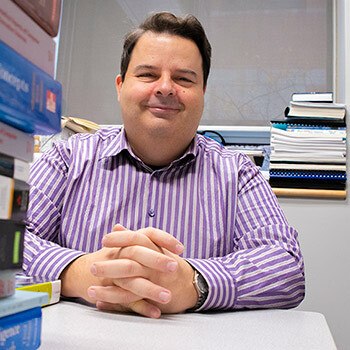 Wilfrid Laurier University Professor Ilias Kotsireas is working to help change that. Kotsireas isn’t a doctor, neuroscientist or biologist. He’s a computer scientist and director of Laurier’s Computer Algebra Research Group (CARGO) Lab. He’s contributing his data mining expertise as part of a research group, which includes Panayiotis Vlamos (Ionian University, Greece), an expert in neurodegenerative diseases, and Ioannis Tarnanas (ETH Zurich, Switzerland), who focuses on technologies for medical applications. The group is collaborating with doctors, psychologists, nurses and representatives from governments and pharmaceutical companies to develop methods of diagnosing non-genetic diseases, particularly neurodegenerative diseases, earlier than is currently possible. The focus is on discovering biomarkers – for example, elevated levels of a certain protein – so that one day, a doctor may be able to use a simple blood test to diagnose diseases such as Alzheimer’s in their early stages, perhaps before any symptoms appear. Kotsireas’s collaborators have access to large quantities of medical data from hospitals and clinical studies. However, only high-powered data mining can sift through all that “big data” in an automated way to uncover hidden patterns – patterns they hope will lead to biomarkers. Such patterns cannot be discovered with traditional database techniques such as SQL (Structured Query Language). For their project, Kotsireas, Vlamos and Tarnanas set up the Research Center on Computational Biomarkers two years ago, hosted by the CARGO Lab at Laurier. At a recent conference in Toronto, the three scientists announced they have set up their computational methodology, a major milestone in the project. Though the links between neurodegenerative disease and computer science may not be obvious, algorithms are actually often inspired by biology, says Kotsireas. These influences show up in data mining techniques, which Kotsireas is using in the biomarker project. Data mining is “a set of techniques and algorithms we use to discover patterns in a data set that we cannot discover with traditional database techniques,” says Kotsireas. Kotsireas and his colleagues identified three basic data mining tasks, called classification, clustering and association rules, that were appropriate for the project. For each of these three tasks, they are looking into dozens of efficient algorithms tailored to discover the complex patterns they’re interested in. In the two years since the project started, a few Laurier students have contributed significantly to the work, says Kotsireas, giving particular credit to Jack Romano and Scott King (both BSc ’18). Kotsireas sees the work he and his colleagues are doing as helping usher in a new era of personalized medicine. For example, a person at risk of developing a particular disease could be alerted to a change in a relevant biomarker even if it’s in the statistically normal range. Drugs could be targeted to an individual knowing how that person is likely to respond. And people could get a better idea of what their personal prognosis is likely to be. This individualized approach is within reach because computational power has increased exponentially. The Commodore 64, introduced in 1982, was so named because it had 64 kilobytes of memory. Now you can put a 512-gigabyte phone in your pocket. One gigabyte is a million kilobytes or a billion bytes. The world of “big data” starts at a trillion bytes, or one terabyte. In recent years, some organizations have built data centres with exabytes of memory. That’s 1018 bytes. Kotsireas and his colleagues are not yet at the point of actually diagnosing patients – they’re still laying the groundwork. However, the type of work they’re doing could potentially be applied to other diseases such as diabetes, cancer, even mental health issues. Kotsireas will be co-supervising a graduate student investigating post-traumatic stress disorder. The end result Kotsireas envisions is “a much better quality in terms of the attention patients receive from their doctors today,” he says. Doctors tend to be under tight time constraints, so data about their patients could provide relevant information quickly. Aside from the intellectual challenges of mining big data, Kotsireas is enjoying the biomarker project for the potential it has to help people.